The re-election of Hassan Rouhani to another term as president of the Iranian regime came as no surprise to experienced Iran watchers and the larger dissident community; particularly since the election process in Iran is essentially rigged from the start by the process of eliminating thousands of candidates who register to run for the office, but this has not stopped the Iran lobby from claiming the win was a mandate for so-called “moderate” policies. One example of this myth-making comes from the National Iranian American Council which noted Rouhani’s win with an analysis on its website. According to the NIAC, more than 41 million Iranians voted in Iran’s May 19th Presidential election, or nearly 75% of the electorate. The NIAC claims that figure included tens of thousands of Iranians in the diaspora with a remarkable feat given the obstacles imposed by Iran’s unelected institutions. It’s a silly argument to make since many election analysts who have studied Iranian elections have noted the past practice of ballot stuffing and double counting of ballots cast in presidential and city council races in order to boost overall numbers. There is also the infamous 2009 election “victory” of Mahmoud Ahmadinejad which was widely considered to be illegitimate for the same tactics. The claim of high Iranian voter turnout would be similar to basing the election turnout for the Hillary Clinton vs. Donald Trump race on counting ballots cast for state races as separate and unique. It is even more ironic for the NIAC to claim a high turnout from the Iranian diaspora when it has previously openly condemned large portions of the diaspora involved in the Iranian resistance movement, such as the People’s Mujahedin Organization of Iran. What the NIAC doesn’t admit to is that the election was precisely a victory for the hardliners because the regime government is controlled and directed by the same hardliners who claim to be moderates. All Iranian officials from the Rouhani on down to the lowliest village representative all have to swear the same oath of fealty and allegiance to the regime’s religious leadership and theocracy. There is no distinction within the Iranian regime between moderates or hardliners since all are beholden to the same power structure. The NIAC also claimed the election was a referendum on the nuclear deal, but what it fails to do is make the distinction of how the election was engineered to deliver a pre-determined outcome. 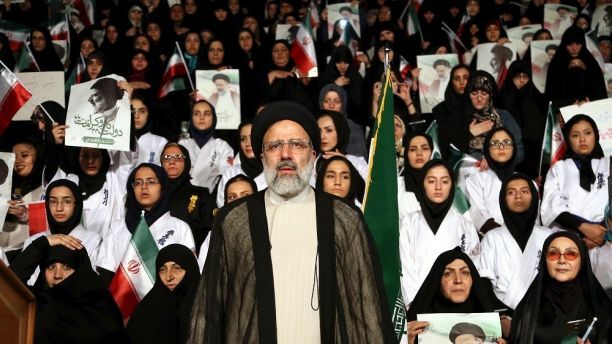 By setting up a race between Rouhani and Raisi, the mullahs created the perception of a moderate vs. hardliner battle and all but ensured Rouhani’s election as a choice of the lesser of two evils. The election was never about the nuclear deal since most Iranians have not received any benefits from the deal and probably won’t for many more years. For Iranians who voted for Rouhani, the election was simply a choice of choosing a less odious candidate than another, which tends to be the basic choices provided by the mullahs. To keep that fiction up, Raisi and his supporters are now even accusing Rouhani of rigging the vote with widespread voter fraud. “Tampering with the numbers of people’s participation is inappropriate. Not sending ballots to centers where the government’s opponent has a chance of getting votes is very inappropriate,” Raisi was quoted as saying. The claim is humorous given the regime’s predilection for rigging elections, but Raisi’s claims might very well be genuine, but in the end irrelevant since the mullahs got the result they wanted, which was to fool the rest of the world. The need to fool the world is necessary for the Iranian regime as it continues to implement an aggressive agenda seeking to expand its sphere of influence throughout the region, which is why recent news that Iranian-backed Iraqi Shiite militias were on the very of opening a land corridor from Iran to Assad-regime controlled territory in Syria is worrisome. The opening of such a corridor would accelerate Iran’s ability to ship weapons and fighters to Syria without having to resort to more clandestine methods such as using commercial Iranian airliners to ferry troops and supplies. Syrian rebel sources have warned of advances by the Syrian army and Iranian-backed militia to reach the border. The news of Iranian involvement in other regions included reports from Afghanistan of Pakistani and Iranian nationals fighting for ISIS elements. Afghanistan Nangarhar provincial Police Chief Abdul Rahman Rahimi said that the Pakistani and Iranian detainees confessed that militants were being funded by Iran and Pakistan. The attack against the U.S. didn’t stop either after the election as top mullah Ali Khamenei continued his customary verbal broadsides against the U.S. by marking the start of the Muslim holy month of Ramadan by ripping Saudi Arabia, saying its Sunni rival is being pumped for money by the U.S., according to Agence France-Presse. Khamenei’s comments comes after President Trump brokered a $110 billion defense deal with the Saudis during his first foreign trip in office. The defense deal between the U.S. and the Saudis will bolster Riyadh’s defense capabilities by providing more equipment and services to combat extremist terror groups and Iran. Even as the Iran lobby claims the Iran election has resolved much, the opposite has been the truth. The campaign season has kicked off and we’re not talking about the U.S. presidential campaign. In Iran the official campaign period for parliamentary elections for slates of candidates that passed ideological muster. For most people living in democracies, the Iranian regime’s election system can be nothing short of baffling. It’s a system that begins and ends with a focus on ideological and religious purity and adherence to the Islamic revolutionary ideals it was founded on. It is also a peculiar system in which the process of reviewing, vetting and examining candidates takes seven weeks to process, but the actual campaign season lasts just seven days. Of the 12,000 candidates who were submitted for consideration to run for parliamentary seats and positions on the Assembly of Experts, nearly half of them were eliminated from the ballot by the Guardian Council, which is comprised of six mullahs and six law experts all appointed directly and indirectly by top mullah Ali Khamenei. The mere fact that the regime is empowered to eliminate any candidate it deems unfit to run virtually pre-ordains any election outcome in the regime’s favor. In the case of the Assembly of Experts, of the 800 that applied, only 161 – all men – were approved by the Guardian Council; a miniscule 20 percent. It’s also noteworthy that in Iran, there are over 250 registered political parties, but virtually none of them represent any true opposition groups such as the Mujahedeen-e-Khalq (MEK), a long-time resistance group which is outlawed and the regime vigorously pursues any of its members. The last two main reform-minded political parties were officially banned after the election fiasco of 2009 which resulted in massive protests that were violently put down. Because of the complete control the regime has over political parties and the ballot, one would think that would be enough to guarantee any election, but in Iran, all ballots are also counted manually and subject to all kinds of shenanigans just in case any candidate who won a seat had a sudden change of heart and wished to oppose the mullahs. The parliament often serves simply as a rubber stamp for Khamenei’s policies since it lacks the constitutional power to oppose foreign policy, military or other matters of state security. The approval of the nuclear deal is an example of that kind of blank check for Khamenei and his puppet, Hassan Rouhani. “Although parliamentarians backed Rouhani on the nuclear deal they did so less out of a sense of support for the president than because Khamenei made it clear he wanted sanctions lifted,” said AFP. The closed nature of the regime electoral process allows the Iran lobby a certain flexibility to portray it in a more flattering light; not in the sense that’s at all fair, but rather in portraying certain candidates as “moderates” when in fact very few who pass vetting would be considered a true moderate, let alone a dissident reformist. An example of that kind of PR spin control comes from the Iran lobby supporters such as the National Iranian American Council (NIAC) which has consistently pushed the idea that the elections would shine a light on growing moderate forces as a result of the nuclear deal. “In order to pass through the punishing vetting process and stand for election, Iranian citizens must comply with a huge set of restrictive criteria, including holding a masters’ degree, adhering to Islam, showing loyalty to the Constitution and the Supreme Leader, and having a spotless political (and mostly spotless criminal) record,” wrote Small Media, a London-based digital advocacy group, in a guest column. 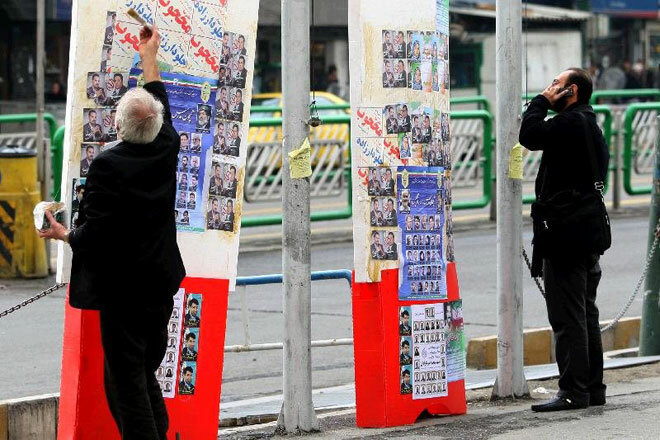 “As evidenced by all the available data, these upcoming elections have been very tightly managed by Iran’s conservative establishment, with the Guardian Council weeding out more than half of the country’s hopeful parliamentary candidates during the vetting process,” Small Media added in what was the closest thing to a criticism of the Iranian regime Lobelog.com has published in a long time. The fact that there is no real opposition to the mullahs allowed and the discussion of moderate elements within regime politics is mainly for international media consumption, it’s pretty obvious why there is so much concern in various capitals over what the mullahs plan on doing after elections when they will wave a so-called “election mandate” to continue their extremist policies. This is why the results of the upcoming U.S. elections will likely have far more impact on what happens to the regime since the Obama administration has made clear its desire to appease the mullahs at every turn. The latest example was the recent announcement of an $8 billion agreement by the Iranian regime to buy advanced military hardware from Russia, including the co-production of Su-30 fighter jets which now appear to be in violation of United Nations sanctions imposed as part of the nuclear deal banning the developing of nuclear-capable delivery systems such as bombers and missiles. According to the terms of the U.N. resolution governing the nuclear agreement, the U.S. and other Security Council members are provided with the power to approve “in advance on a case-by-case basis” most conventional arms sales to Iran. The statute specifically applies to the “supply, sale, or transfer” to Iran of many conventional arms, including “battle tanks, armored combat vehicles, large-caliber artillery systems, combat aircraft, attack helicopters, warships, missiles, or missile systems,” according to the resolution. It seems that not only are regime elections fixed, but it seems UN sanctions are rigged as well.